Ok so here is a quick run down. Gave my car to Tom to work on a timing belt job and tune the car. He suggested some things along the way such as TB shaft seals, the FiTronic flex fuel system he sells, bigger injectors for e85 and the egr delete. Ok great he tunes the car this is when the car still had an evo 9 bov so it was letting air pass through on idle. We schedule a pick up date and the day before I am supposed to pick it up he says there is a problem. The car wants to die on a cold start he says its the IAC and recommends I switch it out as well as buy a tial bov for VTA since he switched it to speed density. When I get home I buy a new amazon IAC, OEM BISS and Oring and the TIAL. I put the IAC in and now the car idles at 2000 but doesn't die on cold starts. The car has no vacuum leaks as far as I checked, no boost leaks. After all this he remote tunes the car again. He tells me to screw the BISS to get it to idle close to the desired idle which is 1140. It goes all the way in and it still can't idle at 1140 but its close. He says its fine and just to deal with it(LOL) No absolutely not I will "deal with it" Now I go to start the car cold, it fires right up to around 2000 then rpms start falling and it wants to die again unless I blip the throttle then goes back to idling at 2000 the rpms go up to 2500 then it starts falling to around 1200 when the car is fully warm. Warm starts are another issue now it takes a 5-6 cranks to get the car to fire. Can somebody please help me get this sorted I am at a loss. The car has no leaks of any kind. It has a new oem oring/BISS and an Amazon IAC. TPS is reading 14.5% on evoscan when the car is off and 100% when I floor it. Could maybe getting the TPS to 13% and adjusting the throttle cable slider to make the TPS be 100% when its floored make it idle lower at idle and thus making me open the BISS to get it to a desired idle? I have a start up log and a warm idle log if people want to see. Tom seems to love love love love telling people they need a new IACV. But, the amazon IACV probably doesn't work. Put the stock one back in that is allegedly "bad". A bad IACV will usually have global issues, not just cold start issues. This sounds like a tune issue. You also wasted your money on a Tial. The stock BOV wasn't an issue. Did the car have idle issues prior to taking it to Tom? The only thing it was doing was every drive which was odd(I only drive my car about 2 times a week very spirited type of driving) Every drive it would do this once, When I clutched out the rpms would drop to 600 rpm from the regular 850-900 it was set at then would pop up automatically. It was doing this literally once per drive wheter it would be pulling up behind somebody at a stop sign clutch out idle drops or lets say I am reversing then clutch out idle drops. Again this didn't happen every time I did that just once per drive maybe twice. I attributed it to lack of tune and having UICP/LICP metal intake pipe. This was when I was still on MAF. And yes I feel like its a tune issue but he is dismissive of that and is saying everything looks like it should in the ROM. One thing that really got me angry was the fact that he did a boost leak test after finding the "IAC issue" and said that the LICP was leaking so he tightened the coupler and told me all is good. I got home and didn't really drive the car that much boost leak tested after the BOV/UICP install and lo and behold leak at lower coupler. I inspected it by taking it off all seemed fine and put it back on, all it took was adjusting the tbolt clamp and then another leak came up by the throttle body(I mean he had the ****ing TB off to fix leaks) and I fixed that my self. And I did put a stock IAC in from a junk yard. Has the mitsu logo and everything on it adjusted the BISS I got it to idle around 1140. Evoscan is showing bouncing between 2 values of 1156 and 1187rpm at idle now. I tired turning it even more down but oddly it wouldn't go down no matter how much I turned, I didn't go crazy by doing full turns but half a turn changing nothing in the idle is suspicious. At first when I put the IAC in though with the BISS all the way down it wouldn't idle cold which was expected, it would fire then die, so I opened the biss till it fired and idled then adjusted via evoscan SAS mode once warm. So I left it idling at 1156/1187. Last edited by TomekEVO; Feb 4, 2019 at 05:54 PM. Are you data logging the IACV trim? It takes a few mins to make it's adjustment after moving the BISS. Also, don't go by the values with the radiator fan on. -Let the car warm up to operating temp (radiator fan will come on). -Once the fan goes off, wait for the trim value to settle (will take a few seconds) and take note of the number. if the value is (+), then you want to back the screw out, if it's (-) then you want to tighten it. -Wait for the fan to cycle on and off a few times until the trim value is the same, each time the fan goes off (remember it takes a couple seconds to settle). Make another adjustment. -Repeat until you get the trim to "0". +/- 0.392 (I think it's 0.392, or something like that) is pretty danged close. The IACV will change in increments of 0.392, so when you see +/- 0.784, you know you are getting close and only need baby adjustments. I usually wait for the fan to cycle two or three times after I have trims at "0", just to make sure it's right. It takes some time, so don't be in a hurry. Also, when it's at "0", it will normally change to +/- 0.392 when the fan is on, that confirms you are spot on. If it changes to +/-0.784 when the fan is on, that means you are probably close enough (but you may as well get it perfect, since you are there). If it seems kinda confusing, I can always make a YouTube video for those of us that like to see things, as opposed to reading it. It appears that I do not have that table to log iscv demand trim ac off. How do I add it to my evoscan? 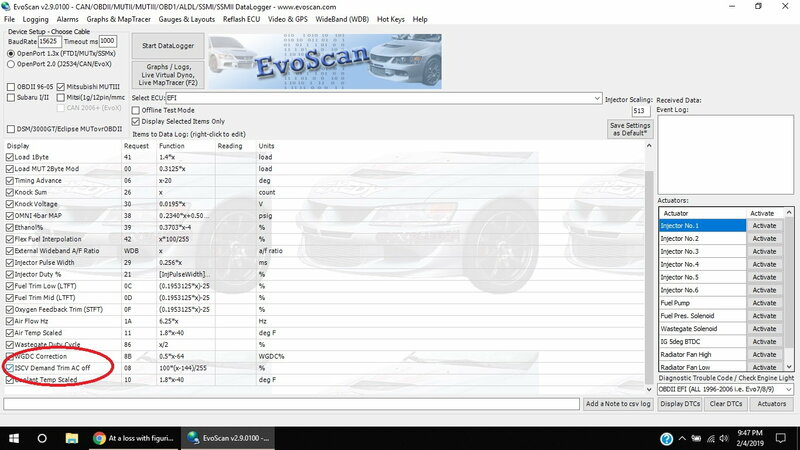 go to the directory "C:\Users\USERNAME\Documents\EvoScan v2.9\DataSettings" and edit the file "Mitsubishi MUTII EFI" adding this line "<DataListItem DataLog="Y" Color="" Display="ISCV Demand Trim AC off" LogReference="ISCVDemandTrimACoff" RequestID="08" Eval="100*(x-144)/255" Unit="% Demand" MetricEval="" MetricUnit="" ResponseBytes="1" GaugeMin="-16" GaugeMax="16" ChartMin="-16" ChartMax="16" ScalingFactor="1" Notes="" Priority="1" Visible="false" />" . Remove quotes and replace USERNAME in the path with your windows username. You will want to use something like notepad++ or wordpad etc to edit it. I just checked a fresh install of evoscan 2.9 though and the entry is there, you might have to use the scroll bar or something like that. I'm 99% sure you have it. My items have been rearranged and I checked the box to only show those I'm data logging. Scroll down ,it's a long list. I put the code in the XML and got it. I tried putting in different OEM IACs I have from junk yards from mitsu cars that have the same IAC and the problems seem to get worse. I just decided to order an OEM IAC from STM. This is so depressing and its taking a mental toll on my regular life as well. Pay someone money to take care of your car and things are still not right. 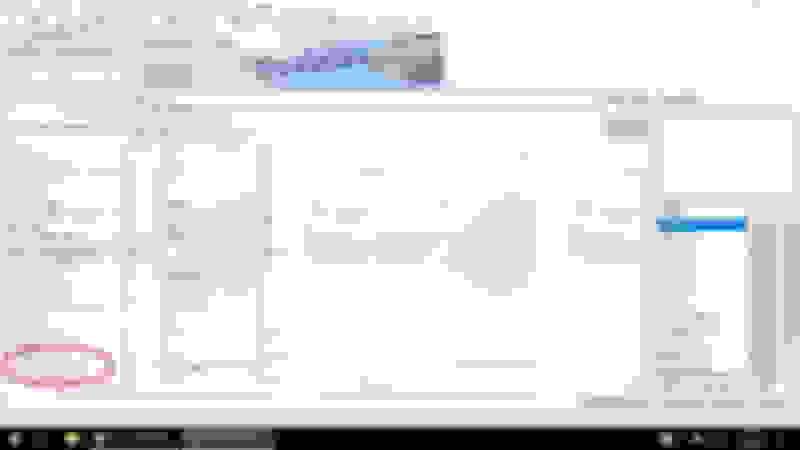 Last edited by TomekEVO; Feb 5, 2019 at 02:42 PM. You couldn't get the trims set on any of them? That's crazy. Bad luck. Sorry ,dude. Looks like a duck swims like a duck quacks like a duck...its probably a duck. Hate to say it but I too agree its tune related. There is no reason the car shouldn't be able to start and idle cold once the tune is dialed in. You even mentioned that you have warm start issues which once again is related to the tune. Sorry you're dealing with this but you need to go back and get this sorted out. And the answer isn't throwing money at mechanical parts because that isn't your issue. I am just gonna wait till the new OEM IAC comes in. Any other critical items I should be logging other than ISC steps and trims?